For those who need (or want) to run Windows (or other operating systems) on their Intel-powered Macs, the leading products in the segment are Parallels Desktop for Mac ( ) and VMware Fusion (plus, there's also Sun Microsystems’ VirtualBox). A year ago, VMware Fusion was the new kid on the block, with version 1.0 earning four mice in its initial review. Now, VMware Fusion 2.0 is available, offering both bug fixes and many features designed to make running alternative operating systems on your Mac as easy as possible. VMware has added a ton of features to Fusion 2.0, many of them aimed at easing OS X-Windows integration. As before, you can drag and drop files and folders between Windows and OS X. But now you can also copy and paste formatted text from one OS to the other (not just plain text, as in 1.0). You can also create mirrored folders: You can set up your Windows virtual machine (VM) so that its Desktop, Documents, Users, and Pictures folders are actually pointers to those same folders in OS X. When you save a document in Word for Windows to the Documents folder, for example, it’ll be saved to your user’s Documents folder in OS X, not to your Windows virtual machine’s Documents folder. As a result, you can access these files at any time from OS X, Time Machine will back them up, and Spotlight will index them. The downside to this mode is that you may be confused by seeing Windows apps on your OS X desktop, and vice versa, and accidentally delete a file you need. (You’ll see Windows files even when Fusion isn’t running.) This feature is off by default, and if you choose to enable it, you’ll need to remember that you’re seeing files from both operating systems in each folder. As of version 2.0, you can also enable application sharing, which will make programs in your Windows’ virtual machines visible to OS X, and vice versa. 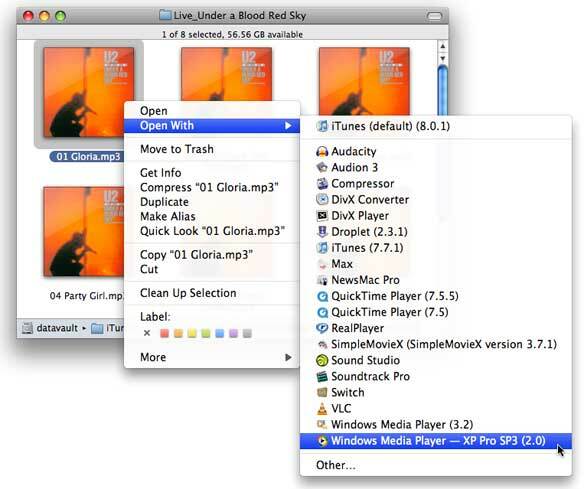 You can enable this sharing from OS X to Windows, Windows to OS X, or in both directions. Once enabled, you’ll see Windows applications listed in the Open With section of the Finder’s contextual menu—control-click on an Excel file, for example, and you’ll see an option to open it directly in Excel for Windows. (For this feature to work, the folders in which the documents reside must be shared with the VM.) If you do a lot of work between the two operating systems, this feature can be a real timesaver. You can share Internet applications in a similar manner. You can specify a default OS X browser or e-mail program, for example, to open the hyperlinks you click on in Windows; the same goes for RSS feeds, Telnet, FTP, and a few other Internet protocols. It’s a bit odd to click a link in Windows and have the OS X Mail program respond, but it works as expected. Fusion also automatically maps standard OS X keyboard shortcuts to their Windows counterparts: press command-C in Windows, for example, and Fusion will automatically send it to Windows as control-C. You can also define your own shortcuts for Windows keys that don’t have a Mac counterpart. Finally, printing is now much simpler. Windows virtual machines will now automatically see any printers that are set up on your Mac, and create each one as a Windows printer. Excel spreadsheets and photographs generally printed fine on my Brother multifunction printer, but you’ll get the best results if you install native drivers in your Windows VM. This can be easily done for networked printers, as both OS X and Fusion virtual machines can use them at the same time. USB-connected printers, however, will need to be specifically assigned to your virtual machines. This can be a bit of a pain if you print from both OS X and Fusion virtual machines, as you’ll have to repeatedly assign and release the printer, depending on which OS you’re printing from. Fusion 2.0 shone in my tests with both Linux and Windows XP Pro; I even found Vista more usable than it had been with the prior version. (XP Pro remains my Windows OS of choice for use on a Mac.) The speed of typical office applications (Microsoft Office 2003 in XP Pro, OpenOffice.org in Linux) was fine, even with image-laden documents and large spreadsheets. Programs loaded quickly, and I was able to run multiple programs at once in both virtual machines without any noticeable slowdowns. For most users, speed won’t be an issue; you’ll likely notice that you’re not running your “real” operating system only when programs in the other OS put maximum stress on RAM or CPU usage—if then. Sharing applications between OS X and Windows makes it possible to open OS X documents in a Windows application, and vice versa. Overall CPU usage has decreased to the point where you can comfortably leave Fusion running in the background, even with an open (idling) virtual machine. On my Mac Pro, a Windows XP Pro virtual machine sitting open in the background typically used between 3 and 8 percent of my CPU; in the prior version of Fusion, that would have typically been 10 to 20 percent. Fusion also spreads the workload nicely across multiple CPU cores. When Fusion 1.0 came out, Parallels Desktop for Mac provided better 3-D graphics support (of interest to gamers and anyone who uses DirectX-based 3-D applications). Fusion 2.0 tilts the advantage in the other direction. While both Parallels and Fusion now support DirectX 9.0c with shader model 2, the Fusion implementation performs better than that of Parallels. That means Fusion can run many 3-D Windows programs that Parallels Desktop can’t. (If you need OpenGL support, Parallels still has the advantage there, as Fusion lacks OpenGL acceleration.) I tested a number of recent games, for the most part successfully: A few ran perfectly, and most ran to some degree, with occasional odd colors and graphical glitches. While Fusion won’t replace Boot Camp for the latest games, it worked very well with older titles. I had no trouble running Tony Hawk Pro Skater 4, Combat Flight Simulator 3, and Kelly Slater’s Pro Surfer. Performance in most was excellent—audio was spot-on, and frame rates were generally fine. My game pad and flight stick both worked, as did my steering wheel, albeit without force feedback. Overall, Fusion makes a very good gaming system for old Windows games, though its abilities will vary by title. Fusion 2.0's DirectX 9.0c support means that many games—both new and old—will run inside a Windows virtual machine. 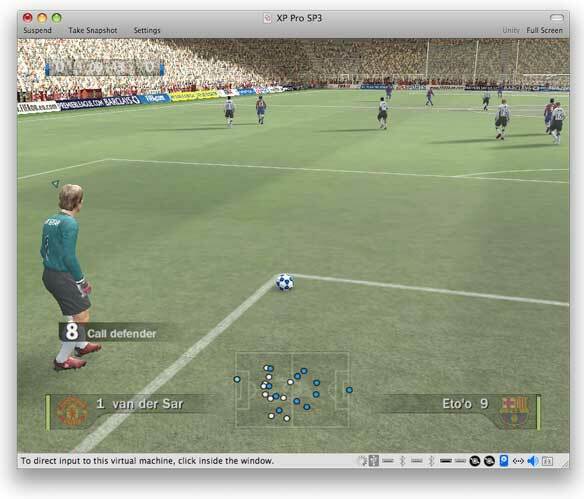 Here's an example from the FIFA '08 demo. I was also able to use some Windows-only 3-D-enhanced Web projects—World Wide Telescope and Photosynth—both of which require good 3-D graphics support in order to run.